Hana no Oasis (花のオアシス) is a flower park with beautiful Clary and Marrygold. It is located in Konosu, Saitama. 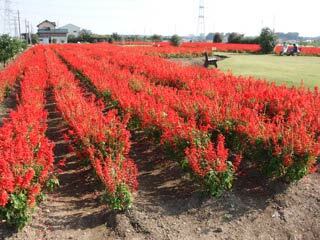 In the middle of October, over 15,000 clary and 5,000 marrygold bloom rich colored flowers. There is parking, but no restroom. 1. JR Takasaki Line to Kita Konosu Station.